“So, there's like a lecture that's only sort of a lecture and then we did this thing that is kind of like an overview before the the lecture, which is before the presentation. Some plays leave you thinking, and though it is now a couple of days since I saw the Bush Theatre’s We Are Proud To Present…, I’m still utterly unsure about it. 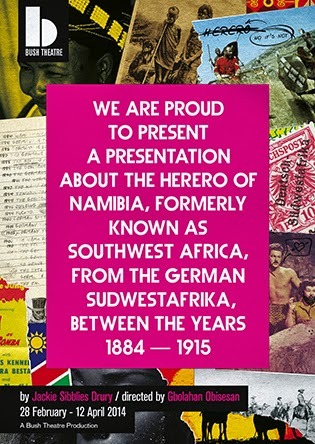 This is the European premiere of Jackie Sibblies Drury’s US hit from 2012 whose full title is in fact We Are Proud to Present a Presentation About the Herero of Namibia, Formerly Known as Southwest Africa, From the GermanSudwestafrika, Between the Years 1884 – 1915 and Sibblies Drury has adapted the text for a British cast, and presumably a British audience. For the play blisters through the weight of our colonial past, the state of current race relations and the ability of theatre to effectively process them, asking if art can find a healing way through such tangled and tortured history to find a potentially brighter future. So it is hard not to feel a little despondent at the way Gbolahan Obisesan’s production plays out, the playwright’s indictment of white people in general so unsettling and thought-provoking, the starkly uncompromising attitude breathtakingly bold. There’s a deal of invention in the set-up too. A group of six actors – four men, two women; three black, three white – gather to give us first an overview, then a lecture and then a presentation about the matter in hand, which is the brutality with which German colonial rulers exploited local tribes in the soi-disant first genocide of the twentieth century in what is now known as Namibia. And as the only primary source of evidence is letters sent home by German soldiers which speak not of their actions, thus the actors opt to improvise their way through what might have happened. Which leads to an interesting exploration of the way in which history is constructed (through the eyes of the ‘victor’), and the way we tell stories (refracted through our own experiences). Here, race becomes a hugely pertinent issue as the actors question whether they can ever get into the mindset of the Herero tribespeople who are at the centre of their work. Can a British black person ever understand what it is like for an African? Can they ever really, truly imagine what life was like a century ago? And where do white people fit into this equation? Initially, a sense of humour prevails about the whole enterprise. Initially the focus is on the internal power struggles in the company, exposing much of the vanity inherent in the creative process. And Sibblies Drury repeatedly flicks between the play-within-a-play and the rehearsal room, showing how the actors serve the material or rather, make it serve as a showcase for themselves. From the ridiculous (impression of an ageing cat) to the sublime (a showboating of the number of accents they can do punches home with immense power about the horrendously repetitive nature of genocides), it’s an effective technique. But as the mood darkens in an evocative if heavy-handed finale, this world suddenly becomes very black and white. We’re left in no two minds about the capabilities of white people, both historically (which seems fair) but also contemporarily (which does not), the quiet after the storm here is most disturbing, the way the play then ends discomfiting, the mood somewhat accusatory in a way that I don’t think is justified. The efforts of the young company are in no doubt – Ayesha Antoine a particular standout – but the intention of the playwright remains unclear.